Find answers to frequently asked questions about the tax credit program for owners of historic homes. If your question wasn't answered here, please Contact Us. 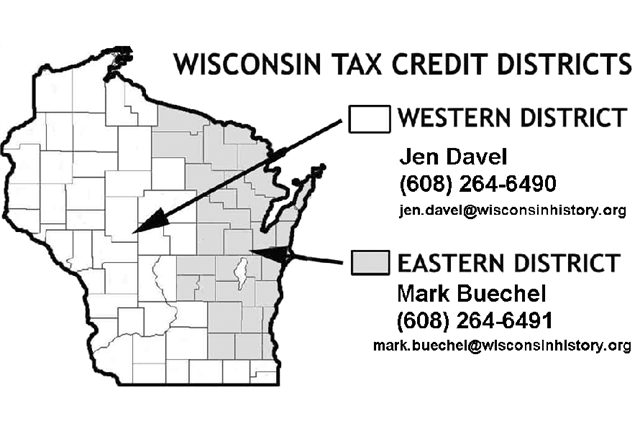 The historic homeowners' tax credit is a dollar-for-dollar reduction in what you owe in Wisconsin income taxes. The amount of the credit is 25 percent of your costs of carrying out eligible work. If your credit is larger than the amount that you owe in state income taxes, you can carry the unused balance into future tax years (up to 15 years into the future) until the credit is used up. First you'll send the tax credit application (Parts 1 and 2) with "before" photos of your property and a list of the work that you'd like to carry out. Next Society staff will review Part 1 of your application to certify that your property is historic. After Part 1, Society staff will review Part 2 of your application to make sure the work you are proposing will not harm the historic character of your property. Preservation architects will review the proposed work to determine if it meets the Secretary of the Interior Standards for Rehbilitation. The society will mail you a letter with the decision. Once Part 1 and 2 are approved, you can carry out the work and take the tax credit year-by-year, based on 25 percent of your costs of eligible work. When you have completed work on your entire project, you will send in a "Request for Certification of Completed Work" form. Along with the form, you'll send in a total of your project's cost and "after" photos that clearly show the work you have carried out. When your request is approved, the Society will mail you a letter stating that your project is closed and complete. NOTE: You have 2 years to carry out eligible work that exceeds $10,000. If you have trouble meeting that requirement, you can extend the 2-year period to 5 years by sending a simple "Request for Five-Year Project Phasing" form with your application. The statutes require that you send this form when you first apply. Otherwise, your project cannot go beyond the standard 2-year period. What kinds of work are eligible for tax credits? What if I'm not certain about whether some of the work is eligible for the credit? The Wisconsin Historical Society has very limited authority to determine whether work is, or is not, eligible. The ultimate authority rests with the Wisconsin Department of Revenue. You should treat this like any other item on your income taxes — claim what you feel are legitimate, eligible expenses and be prepared to support your claims if they are questioned. A project includes all of the work that you list in the application. For example, your application might include roof work, painting, and a new furnace. These items would comprise a "project." Will this reduce my property taxes? No. This is an income tax credit. It does not affect property taxes. Projects are usually approved in 3 weeks or less. We may be able to expedite the review under some circumstances. Please let us know if you have need of urgent approval. Can I submit my application materials via email? No. We cannot accept official applications or subsequent amendments via email. You must hand-deliver or mail all application materials. Can you fax an application form to me? No. The package that we send out contains important instructions that we cannot send to you by fax. First-class mail delivery takes 1 or 2 days and allows us to send you both the instructions and the application forms. You may download the application form or we can send you the forms and instructions as email attachments if you contact us. Do I need to get bids for the work before I apply? No. Although formal bids are the most desirable, sometimes applicants have to use a "best guess," particularly for work that is to take place in future years. Do I need to send you my financial records? No. At the end of the project you send us a single dollar figure representing the total cost of your eligible work. Keep the financial records in your files in case the Department of Revenue wants to know how you arrived at the amount of your claim. Why do you need to see all of the work? Why can't I submit only the work that is eligible for tax credits and leave out the work that will not be approved? We must see the entire project, including work that is not eligible, in order to determine the historic significance of your house throughout your project. Ineligible work must be listed and described in the application. The tax credit, which is a public subsidy, must be used for work that benefits, not detracts from, the historical significance of your house. If, for example, you wanted tax credits to repair your roof but planned a large addition on the front of your house, the historical significance of your house would be severely diminished and the tax credits would not have been used as intended: to promote exemplary preservation work. For this reason, we need to examine your whole project. What happens if the contractors discover additional work that needs to be carried out? Projects may be amended to include new work. I use part of my house as a business. Can I still qualify for the tax credit? Yes, but you must prorate the tax credit by square footage. For example, if 60 percent of the square footage of your house is used as your residence, you may apply for the homeowners' tax credit and multiply it by 60 percent. As a rough example, if you spent $20,000 on eligible work, you would be able to claim $3,000 in tax credits ($20,000 times 25 percent times 60 percent). NOTE: Depending on circumstances, it may also be possible to claim a prorated federal tax credit for that portion devoted to your business. I've heard that there is a maximum tax credit of $10,000. What happens if I have a very large project? Can I submit more than one application? Yes. We suggest that you do this if your project will include more than $40,000 of eligible work. Even though one part of the statutes sets a $10,000 maximum credit per project, you are not prohibited by statute from submitting a second or third project. If you have a project that exceeds $40,000 in eligible work, you should consider breaking it down in to smaller projects between $10,000 (the minimum investment) and $40,000 (the point at which the credit is maximized). The Wisconsin Department of Revenue recognizes this interpretation as valid. Can you provide tax advice for my situation? No. We do not give advice about your individual tax situation. If you need such advice, you should contact a tax attorney, accountant, or the Wisconsin Department of Revenue. Do I have to wait until all of the work is done before I claim the credit? No, you can take the tax credit year-by-year, based on 25 percent of your eligible costs during the year. Please remember that if you do not spend the required $10,000 within the 2-year time limit (or 5-year limit if you submit a phasing plan), you will be obligated to pay back any credit that you have taken. What happens if the cost of my project is different from the actual costs? Differences between estimated and actual construction costs are commonplace and do not require any special action other than reporting the true costs at the end of your project. I understand that work needs to be pre-approved. What happens if I've already started my project? You can claim tax credit for work that begins after your project is approved. Work done before you submit the application must be listed in the "ineligible" category. I just heard about the program, but I've already done all of the work. Can I still claim the credit? No. The statutes specifically require that work be pre-approved. Why do you need overall photographs of my property? Can you return my photos? No. The photographs become part of the public record. When should I consider phasing my project? If you think that your project may go beyond the 2-year limit, you should consider phasing it. Phasing is easy and cost-free. You can close-out your project at any time and there are no penalties for not carrying out work that you have included with your application, provided that you have met the $10,000 minimum expenditure on eligible work. I had a 2-year project, but we're having trouble getting the work completed. Can I extend the tax credit period? No. The statutes require that you submit a phasing plan at the time that you submit Part 2 of the application. Unless you've done that, you are limited to a two-year expenditure period. Please note that, the two-year "clock" doesn't start until the work actually begins. For example, if your project was approved on June 1, 2010, but the contractor didn't show up until August, 2010, you would have until August 2012 to complete the project. If you are nearing the end of your 2-year expenditure period, there is another possible resolution. If you have more than $10,000 of eligible work remaining, you can close out your existing project and submit a new tax credit application for a second project. For a five-year certification, do I have to send a Request for Certification of Completed Work at the end of each phase? No. Send a Request for Certification of Completed Work for the whole project, along with completion photos after all of the work is done. If you send a Request for Certification of Completed Work before your whole project is complete, it will close out your project, making it impossible for you to claim the costs of any remaining work. How can I tell if my house is listed in the State or National Register of Historic Places? If you have a computer with Internet access or can access a computer with Internet access at your local public library, check to see if your property is listed by conducting an online search for your property in the Architecture and History Inventory. If you do not have computer access, contact Peggy Veregin at 608-264-6501 to inquire if your property is listed in the State Register or National Register. If my house isn't listed in the State Register or National Register of Historic Places, can I still qualify? Yes, you can qualify if Society staff can determine your house eligible for listing in the State Register or National Register of Historic Places. To make this determination (called a "preliminary certification"), you need to send in Part 1 of the tax credit application, photographs, and information to indicate that your property meets listing criteria of the State Register or National Register of Historic Places, which are given in the tax credit application package. NOTE: If successful, this process only qualifies you for the tax credit. It does not result in your property being listed in the State Register or National Register of Historic Places. If you elect to list your house in the registers, you must produce a formal nomination to the State Register or National Register of Historic Places. To begin the nomination process contact Peggy Veregin at 608-264-6501. My house has been severely altered, but I plan to use the tax credits to restore it. Can it qualify? Your house can qualify if it is already listed in the State Register or National Register of Historic Places or if it contributes to a State Register or National Register historic district. If it is submitted as a "preliminary certification" through the process described above, you must demonstrate that it meets State Register listing criteria before the project begins. If it does not meet the criteria beforehand, it cannot qualify, even if your plans call for restoring it to its historic appearance. My property is in a historic district. Why do I need to send in Part 1 of the application? Every project needs Part 1 of the application to ensure that the property is still historically significant. Some historic districts, for example, were created nearly 30 years ago. Over that time, some properties have been altered and no longer contribute to the historical significance of their districts. This is true for districts and properties listed in the State Register and National Register of Historic Places. Society staff will review the application and accompanying photographs to determine whether properties are still historic. Find more information about tax credits. 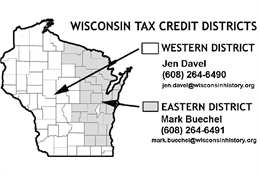 For specific advice about the tax credit program or for advice on other technical historic architecture issues, please refer to the map and contact information below. Note: If you do contact our office, please be aware that this program has generated a large volume of inquiries and meeting the demand is difficult.